5. NOTE:Upon arrival, please tear off the protective film from the front and the back of the plexiglass. What MUAMAX do for you? 1. Durable package guarantees our photo frame in a good condition during shipment. 2. Strict pre-shipping inspection for every frame before shipping. 3. Quality assurance. We promise to replace defective product for you within 3 months. Don't store your photographs in your cell phone. Display them proudly using our wooden picture frames. Buy them from MUAMAX at an affordable price. ANTIQUE DEGISN: 7 x 9 inch antique picture frame made to display pictures 5x7 inch. Environmental paint,High Definition Organic Glass,High quality and durable. Ready to hang the frame on the wall or display on desktop. 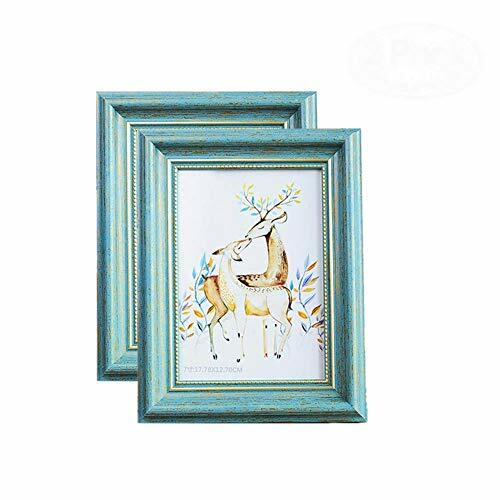 STYLISH LOOKING: Photos or pictures in this classic picure frame will stand out when you put them on the desk or hang it on the wall. Plexiglass cover gives a crystal clear view of your photo - Please tear off the protective film before use. STURDY MATERIAL: This decorative photo frame is made of durable composite wood material; Comes with easy opening tabs at the back for easy access.polished glass front gives a clear view of your picture and preserves the life of your photo. Extremely carefully packaged to ensure it arrives safely! PERFECT FOR HOME OR OFFICE: Dark brown in color with sturdy frame - the perfect classic picture frame for home, office, studio or gifts. Full Satisfaction Guarantee: If you are not satisfied with your order for any reason, contact us directly, we will give you a satisfied solution. View More In Wall & Tabletop Frames. If you have any questions about this product by MUAMAX, contact us by completing and submitting the form below. If you are looking for a specif part number, please include it with your message. Adeco Decorative White Wood Wall Hanging Collage Picture Photo Frame, School of Fish, 8 Oval Openings, 4x6"